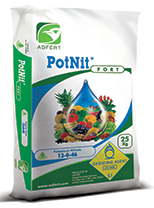 PotNit®FORT (NPC) is an indispensable component in all well balanced fertigation programmers for potassium and nitrogen’, both for soil grow crops & hydroponic systems. PotNit®FORT Potassium Nitrate Soluble grade High purity and full solubility in water make the soluble NPC the perfect fertilizer for fertigation & foliar application, in greenhouse, hydroponics system, and open field. PotNit®FORT is can be mixed with all water-soluble fertilizers, & also compatible to mixed with the majority of pesticide in foliar application. PotNit®FORT can be used to suply the potassium needs for crops without supplying excess of sulphate or chloride.